This is perfect and exactly as described. I cannot wait to give it to my husband for his birthday. Perfect additional gift to go with the Mohagany straight razor shaving set i got for my boyfriend ! Entirely satisfied with my order! 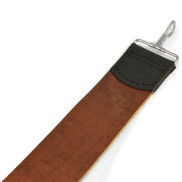 Leather strops are essential when it comes to classic, wet shaving. Stropping your straight razor before every use is the most important thing when it comes to maintaining it nice and sharp. By using a leather strop, you'll keep a fine edge on your straight razor because the back and forth motion realigns the edge by removing small scratches and dents, keeping your razor as sharp as possible and ready to handle even the toughest stubble! There are numerous guides and videos online that will help you understand the proper way to get the most out of your strop. Essentially, there are two methods to hone your blade. Both work very well and your choice should come down to your personal preference. You can either lay the strop on a flat surface or, use the top lock to tie one end up so you can strop freely. 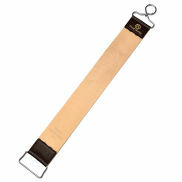 Professional barbers attach the strop to their barber chairs and attain excellent sharpness using that method.